Today, as we go to the polls, our nation is facing some significant challenges. Many Americans are either out of work or underemployed; our national debt is high and increasing at an alarming rate; and after two costly wars with Islamic nations, we are on a course that could lead to a third. Contrary to what some would have us believe, no one political party or president is responsible for these problems. Similarly, no one party or candidate can solve these problems. Regardless of who we elect today, these problems will continue to dog us if we fail to come together after the election and make some hard choices. We are all going to have to make sacrifices and compromises, and it will be easier for us to do this if we remember that the person most responsible for our troubles is not George Bush or Barack Obama, but rather, Osama bin Laden. In 1998, Osama bin Laden declared war on the United States and called on Muslims to “kill the Americans and plunder their money wherever and whenever they find it.” In the years that followed, he frequently called for attacks on the U.S. economy and touted the economic and fiscal impacts of past attacks. He believed that al Qaeda could bring about the downfall of our nation by engaging us in a costly, protracted war, and the objective of his attacks was to lure us into such a war. The wars in Afghanistan and Iraq have been costly in both blood and treasure. Over 6,500 U.S. service members have died in these wars, and more than 48,000 have been wounded. In addition to the human cost, we have spent nearly $2 trillion more on defense than planned. And instead of raising taxes to cover the increased defense costs, we cut taxes to prop up our weakened economy, thereby magnifying the fiscal damage. The following chart shows the U.S. publicly held debt from the time when bin Laden declared war on the United States until the end of 2011. In addition, it shows the debt projections that the Bush administration made in the last budget it submitted to Congress before the 9/11 attacks. In this budget (the Mid-Session Review of the Fiscal Year 2002 Budget), the Bush Administration projected that the publicly held debt would be $1 trillion at the end of 2011. Instead, it was $10 trillion. The following chart shows a breakdown, by category, of the differences between the projections and the actual values the government reported. Nearly half of the total difference came from reduced revenues. About thirty percent came from increased defense costs and increased interest on the debt. Five percent came from increased Medicare expenses, mostly from the prescription drug plan. 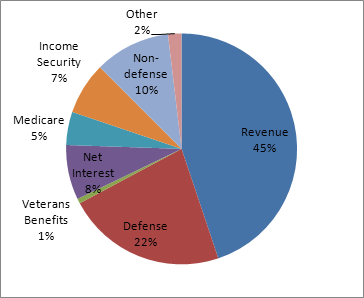 Increased income security payments and non-defense spending increases accounted for the rest. With the exception of the Medicare spending increases, a significant percentage of each of these differences is attributable to the events that were set in motion by the 9/11 attacks. For example, almost all of the defense spending increases resulted from either the wars in Afghanistan and Iraq or the general defense spending increases that were enacted after the 9/11 attacks. In addition, much of the revenue shortfall resulted from the economic impact of the attacks and the tax cuts and other measures that were taken to prop up the economy. The weak economy resulted in additional income security spending, and everything that added to the debt contributed to the increased interest expense. There were of course other factors that contributed significantly to the debt increase, most notably, the 2008 financial crisis. Even this crisis, however, was fueled in part by the interest rate cuts and other actions the Federal Reserve took to stabilize the economy after the 9/11 attacks. Exactly how much of the damage is attributable to these actions is unknown, but it is also mostly irrelevant. For in the end, it does not matter if the damage was done by America’s enemies, or if it was self-inflicted. The sad reality is that the 9/11 attacks were but the catalyst and archetype of the much larger attacks that followed. They were the knives that al Qaeda used to hijack our military and turn it into a fiscal weapon. During the past 11 years, Al Qaeda has used that weapon to blow a huge hole in our government’s balance sheet. By itself, the cost of the wars would not be a threat to the nation’s fiscal stability, but like the fires that raged after the planes struck, the tax cuts and additional spending have greatly magnified the damage. The increase in the debt now far exceeds the value of the Social Security and Medicare trust funds. In effect, the trust funds have been wiped out, and the full weight of these twin towers is now poised to fall on young and unborn Americans. In his 2005 State of the Union address, President Bush said that “the only way our enemies can succeed, is if we forget the lessons of September 11th.” Unfortunately, when President Bush said these words, he was making the case for the war in Iraq. He failed to see that Al Qaeda was using our military as a weapon against us, that his tax cuts were adding fuel to the fires that were consuming the Social Security and Medicare trust funds, and that all of this, including his prescription drug plan, was undermining the stability of these massive programs and threatening the livelihoods of everyone in them, both those supporting them through their payroll taxes, and those whose income and health care was dependent on them. Under President Obama, the debt has increased at an even faster rate than it did under President Bush. Much of this was a result of the 2008 financial crisis and its aftermath, but President Obama added to the damage. In addition to the stimulus bill, he increased defense spending to expand the war in Afghanistan. He also extended the Bush tax cuts and said that if he is reelected, he would make them permanent for all but the wealthiest Americans. If Governor Romney is elected, he has said that he would not raise taxes on anyone, that he would not cut defense, and that he would restore the $760 billion that President Obama had cut from Medicare. 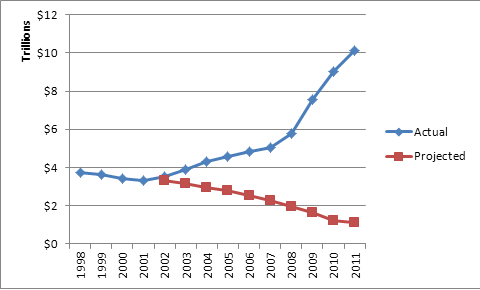 Considering that three quarters of the difference between the projections in the Bush administration’s 2002 budget and the actual results came from revenue shortfalls, defense spending increases and the associated increases in interest payments, it is hard to see how we could repair a significant percentage of the damage of the past eleven years under Governor Romney’s plan. Eleven years ago, we were on course to pay down the national debt in a decade. Osama bin Laden changed that. He charted a new course for our nation, and we are still on that course today. After this election, let us work together to return our nation to the course it was on before the 9/11 attacks. Specifically, let us bring our troops home from Afghanistan, let us roll back the defense and other spending increases, let us phase out the tax cuts for us all, let us shore up the Social Security and Medicare programs, and let us find a way to solve the crisis with Iran without going to war. Let us do these things so that Osama bin Laden will not, even while he lies dead at the bottom of the ocean, achieve the victory that he so long sought. © 2012-2017 Bill Tidd All Rights Reserved.